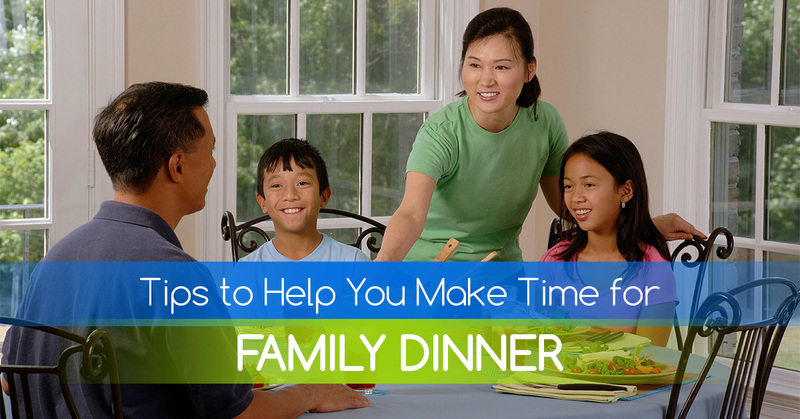 Family dinners are important for kids in many ways, but how do you find the time to actually make dinner? #1. Plan your meals ahead of time. The time you spend looking through your pantry and trying to figure out which ingredients you have to make dinner could be better spent doing almost anything else, and luckily, you can stop wasting that valuable time. When you have some free time, like on the weekends, make a list of all of the meals you plan to make throughout the week and go to the grocery store to get all of the ingredients you need. #2. Prepare and freeze meals. With school, work, piano recitals and soccer practice, our weekday schedules are often full to the brim, and the last thing you have time for is to cook dinner. When you do have some spare time, like during the weekends, use it to prepare your meals ahead of time. Many meals can even be frozen and reheated when you are ready to eat them. One of the biggest benefits of family dinners is that children get more access to highly nutritious foods, like vegetables. However, it can take a lot of time and energy to chop up vegetables for every meal, so why not buy frozen? If you buy vegetables at your local grocery store, it can take months from the time they are picked to the time they are put on the shelf, which means that you are actually getting fresher vegetables when you buy frozen. Plus, frozen vegetables are almost always pre-chopped or cut, freeing up more of your valuable time. #4. Take advantage of your crockpot. There are so many meals that you can throw in the crockpot in the morning and enjoy as a family at night. Whether you cook pot roast, vegetable minestrone or chili in your crockpot, it will save you a lot of time and hassle in the evening. Plus, you can even buy crockpot liners that make cleaning up after dinner a snap! #5. Make more than you need. When you do take the time to cook dinner, make enough so that you can eat leftovers for a few meals afterward. Leftovers are easy and economical, making them the perfect option for many families. Family dinners are important, and there are lots of things you can do to make it easier to get a home-cooked meal on the table every night. Do you have questions or concerns about our daycare in Columbia? Contact us today!